Compassionate use for Niemann-Pick Type C and Gangliosidosis´ with Acetyl-DL-Leucin at the LMU Munich – Hand in Hand gegen Tay-Sachs und Sandhoff | in Deutschland e.V. Summary of the talk at the 2.German Family Conference held through Hand in Hand gegen Tay-Sachs und Sandhoff in Deutschland e.V. on the 14th October 2017 in Würzburg, Germany. Acetyl-DL-Leucin is a slightly modified essential amino acid, known by the brand name Tanganil. Amino acids are parts of proteins. The drug is available in France for more than five decades now and was prescribed against dizziness. It is a mixture of two stereoisomere: D and L.
The drug has nearly no side effects, until now no frequently or occasionally side effects were recognised. The actual mechanism of action is still unclear. The state of research indicates that, among other things, there is a stabilisation of membranes of the nerve cells. In studies with humans and animals we achieved positive visible results. In 2013 the first study about the effectiveness of this substance in patients with progressive cerebellar diseases, a so called degenerative cerebellar ataxia had been published. Walking and speech disorders improved and uncoordinated movements were mitigated. 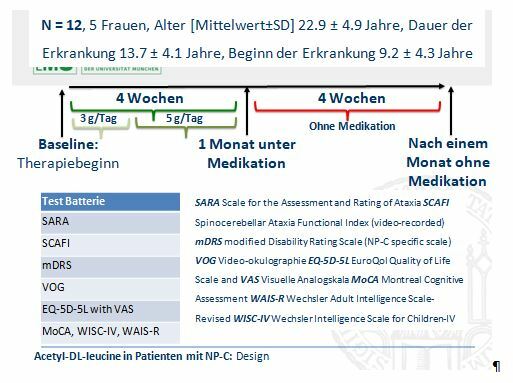 Dr. Tatiana Bremova herself was part of the committee during a study with patients with niemann pick type c.
For measurement the Scale for the Assessment and Rating of Ataxia (SARA) and the Spinocerebellar Ataxia Functional Index (SCAFI) had been used. Noted side effects were dizziness in one case, that didn´t last long. Otherwise there were no side effects. Due to this we have a very good ratio of risks and benefits.